Delivered, Without The Mess. The Cleaner Solution. Our premium lawn and garden products are guaranteed to make a profound difference to your outdoor landscapes as well as your lifestyle by minimizing the hassle and mess of bulk delivered landscape products. We deliver it to you, when you want it, where you want it and most importantly with NO Mess! A premium blend of Black Earth, Compost, Sand, Organic Fertilizer and Lime. Perfect for starting flower or vegetable gardens, filling planters, topdressing and enhancing tired, existing soils. This nutrient rich soil, high in organic content, has been formulated specifically for your local gardening conditions. A blend of 95% local organic based soil, 5% recycled compost designed to improve soil composition. Adds nutrients to depleted soils while increasing airflow and water retention to the root zone. Professional quality screened loam or topsoil mix, designed with lawn health in mind. Promotes deep root development for grass lawns as well healthy germination of grass seed. Can be used for new lawns, topdressing or mixed with an amendment or compost for any growing area. 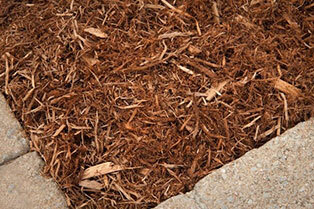 An all-natural ground cover that improves the look around trees and in flower beds. No colour added decorative mulch. Manderley Natural Mulch is a great alternative for low to no sun areas where conventional grasses have difficulty growing. Our decorative black mulch creates the impression of organic soil, while retaining the qualities of natural mulch that gardeners love. It looks great around trees or in flower beds. Manderley Black Cedar Mulch is a great alternative for low to no sun areas where conventional grasses have difficulty growing. 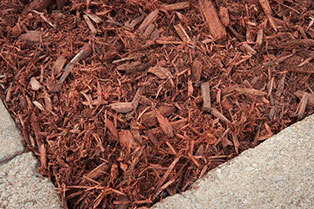 Our decorative red mulch has a beautiful hue that can brighten up any growing area. It looks great around trees or in flower beds. Manderley Red Mulch is a great alternative for low to no sun areas where conventional grasses have difficulty growing. Manderley offers premium marine and vegetal based compost mixes created with regional growing conditions in mind. Manderley composts will add richness to any growing area. Natural, rustic river stone: 3/4 – 1 1/2 (20 – 40 mm) (3577). For use in landscaping and xeriscaping – perfect for garden features, drainage rock and as filling for retaining walls. 0-3/4" (0-22 mm) crushed stone, for use as compactable base material for projects such as new driveways, laying patio stones, filling retaining walls, etc. Can be used as a backfill material. Finely graded masonry sand perfect for use as a levelling base beneath patio stones or mixed in cement for grouting and brick laying. The fine texture of this sand makes it an excellent substitute for beach sand in playgrounds, sandboxes or volleyball courts.